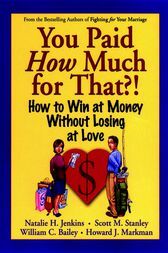 Money is the number one problem area for couples because money isn't simply about dollars and cents. If you scratch the surface of almost any money issue, you'll find a relationship issue complicating if not actually driving the problem. That's why You Paid How Much For That? not only sound reveals principles of money management but also provides you with practical tools to uncover and understand the deeper, often hidden meanings of money and conquer the problems it raises in your relationship. * Learn how a Saver and Spender can live together-happily! * Gain a healthy respect for what money can-and can't-do for you. * Understand how your upbringing, culture, and gender influence how you and your partner approach relationships and money differently. * Find out how to solve problems together in ways that promote teamwork. * Discover practical ways to get what you both want most. * Capture a vision for a prosperous and loving future together. Title: You Paid How Much For That?! Natalie H. Jenkins is vice president and marketing director of PREP, Inc., provider of one of the most respected marriage enrichment programs in the world. Scott M. Stanley of the University of Denver is a noted expert on commitment and coauthor of Fighting for Your Marriage. William C. Bailey teaches family economics and studies attitudes toward money at the University of Arkansas. Howard J. Markman of the University of Denver is noted for his work on divorce prevention and coauthor of Fighting for Your Marriage.